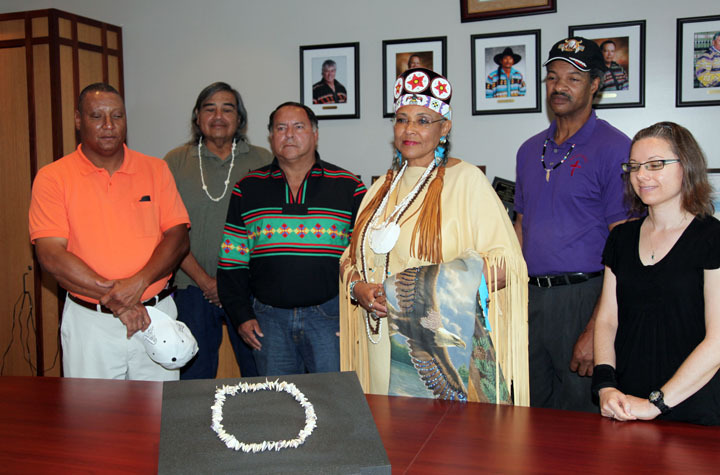 BIG CYPRESS — The Seminole Tribe’s Ah-Tah-Thi-Ki Museum reunited the Roanoke-Hatteras Band of North Carolina with a piece of their history on July 12 by returning an early 20th-century shell necklace made by their people. Museum employees, Seminole Tribal members and leaders, and Roanoke-Hatteras delegates met at the curatorial building conference room in Big Cypress for the exchange. “It’s very rewarding to do this and see the necklace find its home,” said Tara Backhouse, Collections manager of the Museum. The Museum acquired the necklace in 1997 when it purchased a collection belonging to Frank Speck, an American anthropologist and professor at the University of Pennsylvania who studied Native American Tribes. Backhouse said they purchased the 200-plus piece collection for several Seminole artifacts – including a model canoe, turtle rattles and masks – and catalogued the items. When Backhouse researched the pieces, she discovered the necklace belonged to the Roanoke-Hatteras Band. “We decided to deaccession it and reunite it with the Tribe that created it,” she said. In order for the Museum to deaccession pieces of any collection, they must get permission from the Tribal Council. Backhouse said they require this to ensure no piece of Seminole history gets lost. Roanoke-Hatteras Council Chairperson Marilyn Berry Morrison accepted the necklace on behalf of her Band, which is affiliated with the Algonquian Indians of North Carolina Inc., a nonprofit organization comprised of people descended from the Roanoke-Hatteras and Mattamuskeet bands who are committed to keeping the heritage and culture of their ancestors alive. 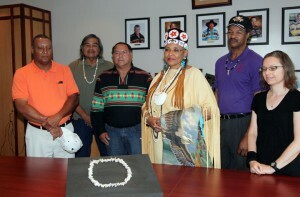 As a token of her appreciation, she presented Big Cypress Board Rep. Joe Frank with a shell necklace made by her Band. “I truly feel our ancestors are pleased,” she said. The Museum, which houses more than 20,000 archival and artifactual items belonging to the Seminole Tribe of Florida, also returned artifacts to the Cherokee and the Catawba Indian Nations last fall. The Cherokees received seven items, including several buffalo fur masks, while the Catawba received 26 items, including several ceramic vessels.